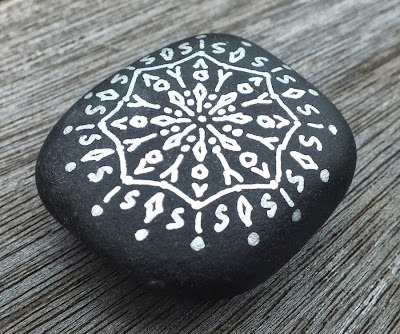 Not all I find on the beach has to do with Alchemy Stones. When I was out for one of my walks yesterday, I found something unusual: A "Spirit Bear." Among collectors of such objects-- most prominently found among indigenous tribes of the US Southwest-- this would be known as a "natural fetish." In this case, loosely in the shape of a stylized bear. 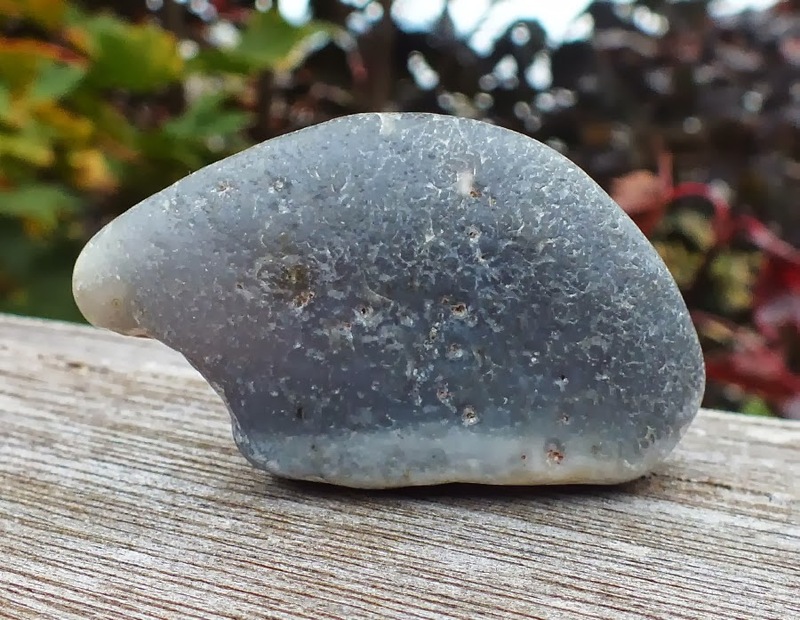 This particular piece is actually a fairly large gray banded agate that happens to have broken and been polished by rocks, surf and tides to this particular shape. According to the mythology of the Zuni Tribe (located in New Mexico and Arizona, primarily), Bear has the power to heal and to transform human passions into true wisdom. Bear represents the power of healing through introspection and "going within" for answers... and reminds us that, to some, the period of hibernation may appear like a form of depression when-- in fact-- it is a period of healing and gaining strength for new challenges ahead. Traditionally, Bear is also considered to be the Guardian of the West. Interestingly enough, I found this Spirit Bear as I was walking home towards the west, towards the setting sun. At first, I thought it was just a gray rock, but when I held it up to the sun... it became obvious that it was actually a piece of banded agate. "Natural" fetishes (or "spirit animals") are quite rare and highly prized. Many people are probably familiar with the Zuni carved versions you often see in galleries throughout the Southwest. 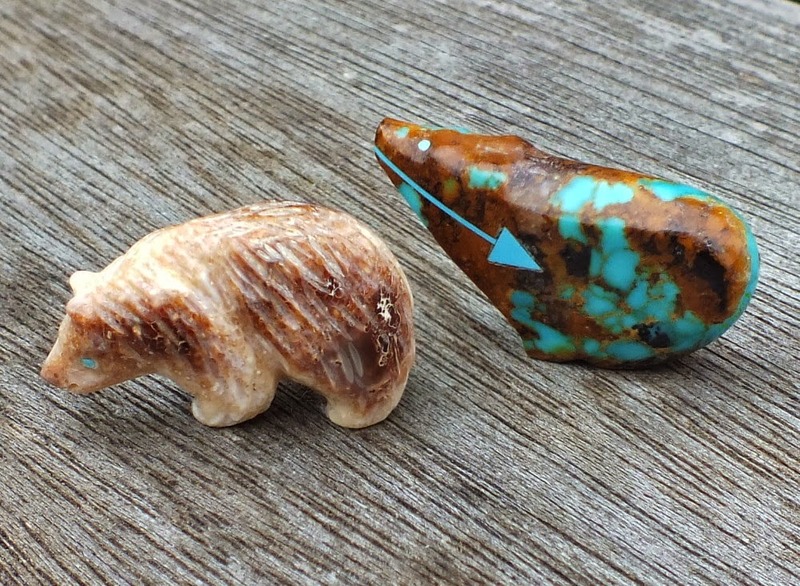 Pictured here are a pair of modern Zuni fetishes featuring bears. On the left, a more "realistic" style; on the right, a more stylized version... closer to the traditional native carvings. As you can see, the shape of the "natural" bear does bear quite a resemblance (no pun intended) to the deliberately carved shapes. 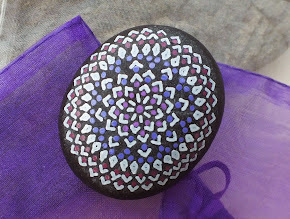 Recently, I have started painting rocks again. Maybe it's the onset of of shorter days that's inspiring me to undertake more creative "indoor" ventures. I have been working on designs using silver paint, and which also make use of more solid lines in the patterns, like this piece with a star. Silver is interesting-- and rather tricky-- to work with because it's not really "paint," in the traditional understanding of the word. Rather, it's tiny metallic shavings in a liquid "suspension" of sort. I only use silver on very dark (almost black) rocks, because the suspension leaves behind a "shadow" of sorts, on paler backgrounds. The end result tends to be rather magical, however. The properties of the silver decoration varies tremendously, depending on the light conditions. In bright light, silver patterns look more or less like they are "reflective white," and they are not necessarily the most eye-catching. However, in low light silver becomes brighter and almost luminous. 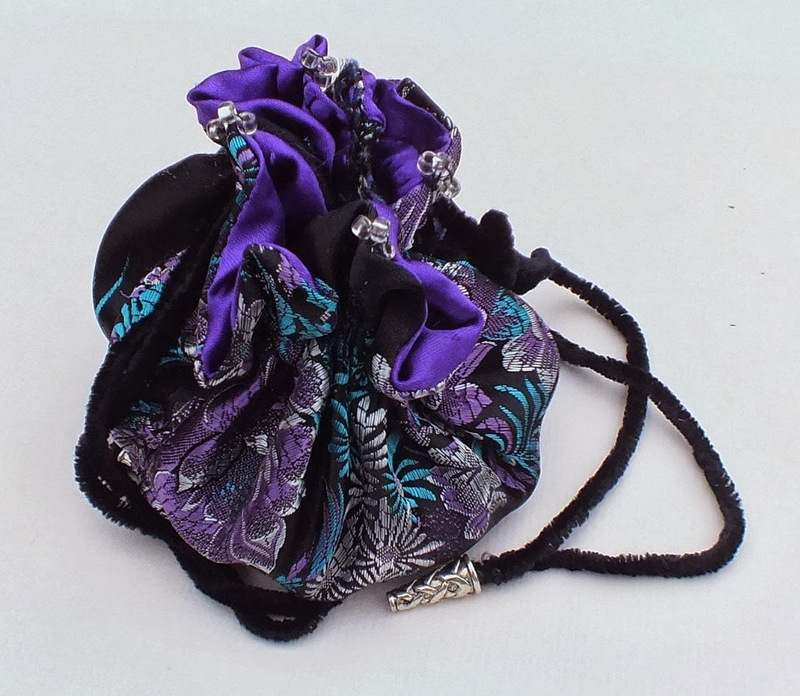 As a simple experiment, I was looking at this design while sitting at the table. Then I walked it down the dark corridor towards the bedroom... and the pattern totally "popped" in the dark. 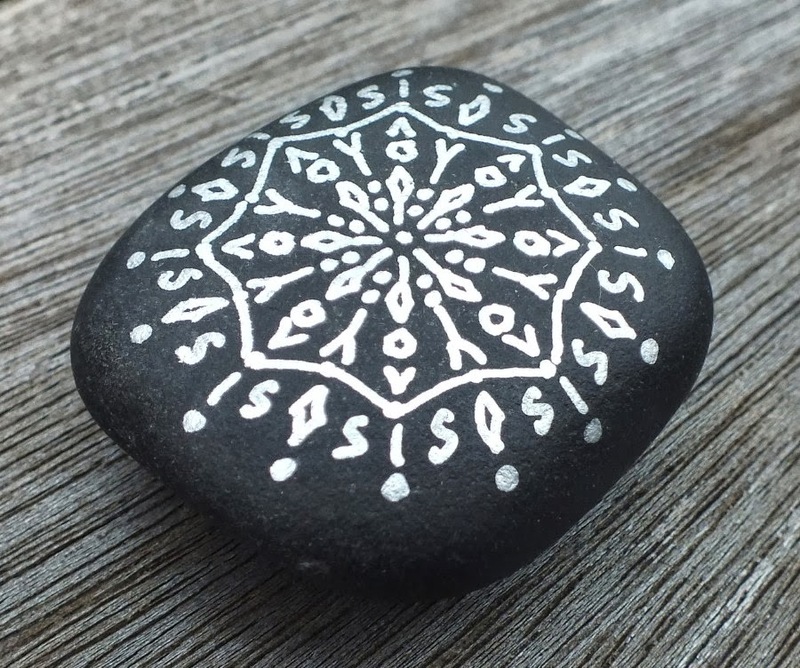 Part of the appeal of Alchemy Stones is precisely that they change appearance, right before your eyes.